For the unreleased Sega Saturn game, see Viper (Saturn). The Viper is a third-party six button arcade stick, compatible with both the Sega Mega Drive and Super Nintendo Entertainment System. Its origin is not fully understood - it is thought to have been produced by Conrad Electronics in the early 1990s and sold across Europe, with a North American variant, the Pro Player being sold by Naki. 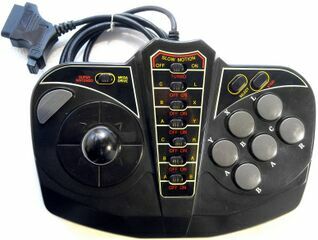 The controller was re-released as the Viper III (it is not known if a "Viper II" exists), although the differences between the two models are not obvious. The Viper III distinctly labels the button, potentially missing in the first model.